Darren Parker is a professional mobile DJ based in Dorset providing DJ & disco hire for weddings, parties, school discos and other events. 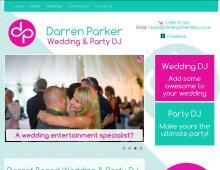 Darren Parker has over thirty years experience as an established wedding DJ in Dorset. Darren has an extensive play list and covers all types of music genres. He works with the bride and groom to create the right atmosphere and ensure a perfect party for every wedding reception. Darren is an expert school disco DJ in Dorset, as well as being sought after for local school proms as he keeps abreast of the latest music choices for the younger generations. Disco hire in Poole, Bournemouth & throughout Dorset can be booked for a family gathering, corporate event or birthday party. Expect a friendly party DJ who wants your event to be a great success using the best selection of music to suit your requirements.This mobile disco DJ really is one of the best in the Poole & Bournemouth area.